Does respiratory health contribute to the effects of long-term air pollution exposure on cardiovascular mortality? There is growing epidemiological evidence that short-term and long-term exposure to high levels of air pollution may increase cardiovascular morbidity and mortality. In addition, epidemiological studies have shown an association between air pollution exposure and respiratory health. To what extent the association between cardiovascular mortality and air pollution is driven by the impact of air pollution on respiratory health is unknown. The aim of this study was to investigate whether respiratory health at baseline contributes to the effects of long-term exposure to high levels of air pollution on cardiovascular mortality in a cohort of elderly women. We analyzed data from 4750 women, aged 55 at the baseline investigation in the years 1985–1994. 2593 of these women had their lung function tested by spirometry. Respiratory diseases and symptoms were asked by questionnaire. Ambient air pollution exposure was assessed by the concentrations of NO2 and total suspended particles at fixed monitoring sites and by the distance of residency to a major road. A mortality follow-up of these women was conducted between 2001 and 2003. For the statistical analysis, Cox' regression was used. Women with impaired lung function or pre-existing respiratory diseases had a higher risk of dying from cardiovascular causes. The impact of impaired lung function declined over time. The risk ratio (RR) of women with forced expiratory volume in one second (FEV1) of less than 80% predicted to die from cardiovascular causes was RR = 3.79 (95%CI: 1.64–8.74) at 5 years survival time and RR = 1.35 (95%CI: 0.66–2.77) at 12 years. The association between air pollution levels and cardiovascular death rate was strong and statistically significant. However, this association did only change marginally when including indicators of respiratory health into the regression analysis. Furthermore, no interaction between air pollution and respiratory health on cardiovascular mortality indicating a higher risk of those with impaired respiratory health could be detected. Respiratory health is a predictor for cardiovascular mortality. In women followed about 15 years after the baseline investigation at age 55 years long-term air pollution exposure and impaired respiratory health were independently associated with increased cardiovascular mortality. There is growing evidence that short and long-term exposure to high levels of air pollution may increase cardiovascular morbidity and mortality [1–5]. In addition, epidemiological studies have shown an association between increased levels of air pollution and exacerbations of airways diseases  or impairments of lung function . There is also support for a link between respiratory health and cardiovascular mortality [8–10]. To what extent the association between cardiovascular mortality and air pollution is driven by the impact of air pollution on respiratory health is unknown. It is hypothesised that pulmonary inflammation induced through harmful particles may cause the release of mediators that increase blood coagulation [11, 12]. Other studies have shown that increased blood coagulability or viscosity is a risk factor for cardiovascular mortality . However, other mechanisms not related to respiratory health including systemic inflammation, accelerated atherosclerosis and altered cardiac autonomic function may also be responsible for the effect of particle exposure on cardiovascular mortality . Studies have shown that people with pre-existing respiratory disease have a higher risk of dying from cardiovascular causes due to short-time variations in air pollution exposure [14–17]. Whether people with pre-existing respiratory disease have a higher risk of dying from cardiovascular disease after long-term air pollution exposure is not clear. We have shown that high levels of air pollution were associated with a reduction in lung function, impaired respiratory health and chronic obstructive lung disease  in women aged 55 years from the Ruhr Area in 1985–1994. We also showed that these levels of air pollution increased the risk of mortality in the same group of women during a follow-up until 2002/2003 . (1) Is impaired respiratory health a risk factor for cardiovascular mortality? (2) Alongside long-term air pollution exposure, is impaired respiratory health an independent risk factor for cardiovascular mortality? (3) Is there a difference in pollution induced cardiovascular mortality in people with and without impaired respiratory health? The SALIA cohort (Study on the influence of Air pollution on Lung function, Inflammation and Aging) was initiated as part of the Environmental Health Surveys introduced by the North Rhine Westphalia government in the mid 1980s, focusing on the effect of air pollution on respiratory health in women and children. Consecutive cross-sectional studies were performed between 1985 and 1994 in the Ruhr area and two rural towns as reference areas. The study population comprised 4874 women aged 55 at the time of entering the study who were living in pre-defined residential areas and willing to participate. In the years specified, the study areas included Dortmund (1985, 1990), Duisburg (1990), Essen (1990), Gelsenkirchen (1986, 1990) and Herne (1986) which represent a range of high-polluted areas. The two rural towns, Borken (1985, 1986, 1987, 1990, 1993, and 1994) and Dülmen (1986) were chosen as reference areas. About every second responder was invited to have her pulmonary function tested, exceptions were Dortmund in 1990 where no lung function measurements were performed and Borken in 1993/94 where all women were invited to participate (N = 2593). The follow-up study was conducted by the Institute of Epidemiology (GSF Munich) between January 2002 and May 2003. All women were followed for the cause of specific mortality. Causes of death were obtained from official death certificates and were coded according to the International Classification of Diseases, Ninth Revision (ICD-9). Mortality for all causes of death and cardiovascular (ICD9-400-440) causes were recorded. The analysis was restricted to 4750 from the 4874 women whose complete information was available from the baseline investigation and who could be followed-up in 2002–2003. Women who moved during the follow-up period and who were lost for the follow-up after moving were judged censored at the time of movement. Otherwise, survival time was censored at the time of follow-up or the time of death from causes other than cardiovascular. The cause of death is known for 399 women. The analysis presented focuses on cardiovascular mortality. Baseline co-morbidities and potential risk factors such as smoking and the level of education were assessed by a self-administered questionnaire. All returned questionnaires were checked by the investigating physician. We grouped the women according to their reported smoking habits: never smoker without environmental tobacco smoke (ETS), passive-smoker (ETS at home and/or work place), past smoker and current smoker (<15 pack years; 15–30 pack years and >= 30 pack years). Current smokers with missing information about the numbers of cigarettes smoked were assigned to smokers with > = 30 pack years. These variables were used to control for confounding. Their socio-economic status was determined by categorizing the women into three levels of education using the highest school level completed by either the women or her husband as low (< 10 years), medium (= 10 years) or high (> 10 years). Do you usually cough in the morning, when you get up or during the day? If yes: Do you produce phlegm when you have this cough? Do you have a physician's diagnosis of chronic bronchitis? 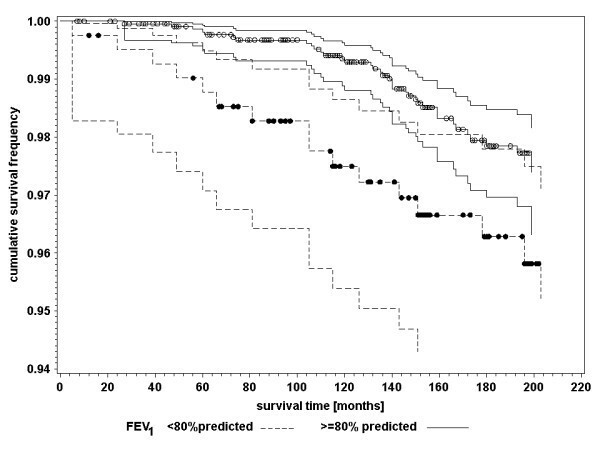 We defined impaired lung function by using FEV1 < 80% and FVC < 80% of the predicted value of each parameter. These cut-offs were also used in the re-analysis of the Harvard Six City Study . To verify that these reference equations were suitable for our study collective, we applied them to the women living in the rural areas (reference areas). It turned out that the reference equations fitted very well the lung function values of these women, i.e. 5% of these women had lung function values below the 80% cut-offs. We obtained the air pollution measurements data from 8 monitoring stations maintained by the State Environment Agency of North-Rhine Westphalia. In each city concentrations of ambient air pollutants were measured at fixed monitoring sites representing urban background levels. The monitoring stations are located in an 8 km grid throughout the women's residential areas. However, the air pollution data from Borken and Dülmen are incomplete, because continuous measurements in this region started in 1990. For the years proceeding 1990, the data were imputed by using measurements (1981–2000) from 15 monitoring stations in the Ruhr area assuming similar trends. Estimated 'average' differences were added to the levels measured in 1990 to 1991 for the imputation of air pollution concentrations in the years before 1990. The estimated average differences were 1.02 μg/m3 per year for NO2 and 1.36 μg/m3per year for PM10. More details can be found elsewhere . To estimate the long-term air pollution exposure we used five-year means of measurements done before the investigation. The concentrations of nitrogen dioxide (NO2) were measured half-hourly by means of chemo-luminescence. Total suspended particles (TSP) were gathered with a low volume sampler (air flow: 1 m3/h) and measured using beta-ray absorption. For reasons of comparability with studies based on PM10 measurements (particulate matter with aerodynamic diameters less than 10 μm), we estimated the corresponding PM10 values by multiplying the TSP measurements with a conversion factor of 0.71. Details for justification of this conversion factor can be found elsewhere . We further used geographic information system (GIS) software Arc GIS 9.0 (ESRI Redlands, Cato) to calculate the distance of the residential address to the nearest major road with more than 10,000 cars/day. A distance of 50 m to the nearest major road was used as cut-off to reflect small-scale spatial variations in traffic related exposure. Traffic counts were provided by the North Rhine Westphalia State Environment Agency (LUA NRW). First, we investigated whether cardiovascular death was associated with impaired respiratory health. The assumption of proportional hazard was tested by introducing a time-dependent covariate into the Cox' model . This new variable was defined as the product of the logarithm of survival time with the binary variable characterising impaired respiratory health. The proportionality assumption was rejected when the regression coefficient of this covariate was significantly (p < 0.1) different from the null value. We presented relative risks of cardiovascular death due to respiratory health impairment at two survival times (5 years (60 month) and 12 years (144 month)) which correspond roughly to the 25th and 75th percentile of the survival time distribution of those who died in the study group. Second, the risk ratios of cardiovascular mortality for each air pollution indicator were estimated adjusted for potential confounders (model (a)). Educational level and smoking behaviour had already been identified as relevant confounders in our previous paper . Then, respiratory health indicators were additionally considered in the Cox' regression analysis (model (b)). If the assumption of hazard proportionality for the respiratory health strata was not met (result of step one) then a stratified analysis was done and, if no interaction between respiratory health and air pollution exposure had to be taken into account (if otherwise see step three), common risk ratio estimates of the strata were given. No or negligible differences between the estimated risk ratios for air pollution exposure between model (a) and model (b) indicate that respiratory health is an independent risk factor for cardiovascular mortality alongside air pollution exposure. Third, it was determined whether the relative risks for air pollution associated cardiovascular mortality were different in strata defined by respiratory health. Because of the small power of interaction tests a p-value of 0.3 or less was chosen as indication for interaction. If the p-value was less, then no combined estimates but estimates for both strata are given separately. Risk ratio estimates of continuous exposure measures refer to unit steps as chosen in [18, 19], i.e. 16 μg/m3 and 7 μg/m3 for NO2 and PM10, respectively. Survival times in subgroups defined by respiratory health indicators were graphically depicted by Kaplan-Meier curves with 95 percent confidence limits. All analyses were conducted with the statistical software SAS. For Cox' regression analysis, we used the procedure PHREG of SAS version 9.1 for windows (SAS Institute Cary, NC). In total, 4750 women were in the study, and a percentage of 54.5% underwent lung function testing. Distribution characteristics of the whole study group and, separately, of the sub-group with lung function measures are summarised with respect to respiratory health, mortality and other socio-demographic indicators in table 1. Due to the study design the women who had their lung function tested lived to a larger extent in rural areas and related to that they were to some extent healthier and smoked less than those in the whole study group. Again, because of the design, air pollution exposure in the sub-group with spirometry was slightly lower than in the whole study group (table 2). In table 3, crude risk ratios (RRc) demonstrate that cardiovascular death was associated with impaired respiratory health and unfavourable lung function values. The association between cardiovascular mortality and impaired respiratory health defined by diagnosis and symptoms demonstrated a different time pattern than that defined by lung function measurements. The association of the diagnosis of chronic bronchitis with cardiovascular mortality did not change over time: Women with the diagnosis of chronic bronchitis had an increased risk ratio of dying from cardiovascular causes at 60 months survival time (RRc = 1.53; 95% CI: 0.83–2.79) and at 144 months survival time (RRc = 1.65; 95% CI: 0.93–2.95). Similar results were found for frequent cough with phlegm production. The impact of impaired lung function at age 55 years on cardiovascular mortality however declined over time. Figure 1 and 2 show the survival curves of women with and without impaired FEV1 and FVC. The proportionality assumption is not valid. 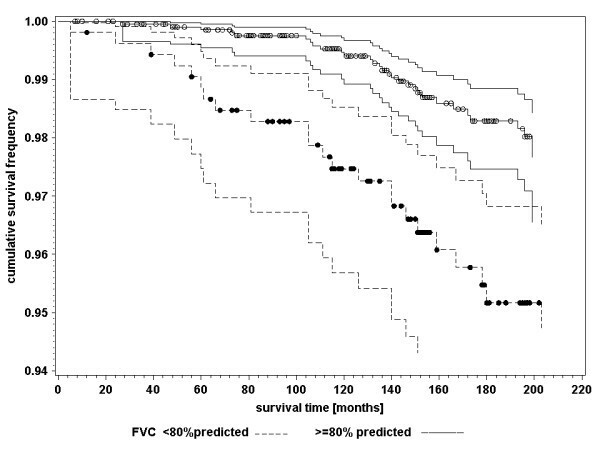 Interaction with survival time was significant for both lung function indicators (table 3). The risk of women with impaired lung function at age 55 years to die from cardiovascular causes at the age of 60 years, was 3.8 to 5.0 times higher than the risk of women without pathological findings of the lung function. The risk ratio at the age of 67 years declined near the null value (table 3). Kaplan-Meier survival curves with 95 percent confidence limits of cardiovascular mortality for women aged 55 years at baseline investigation with FEV1 < 80% predicted and FEV1 ≥ 80% predicted; dots indicating censored events. Abbreviations: FEV1: Forced expiratory volume in 1 second. Crude risk ratios (RRc) and 95% confidence interval (95% CI) of cardiovascular mortality for impaired respiratory health and lung function indicators at 5 and at 12 years of survival time and p-value for interaction with baseline, results of Cox' regression analysis. In a previous paper we could provide evidence that an increase of exposure to PM10 was strongly associated with a reduction of lung function (FEV1: 5.1% (95% CI 2.5%–7.7%), FVC: 3.7% (95% CI 1.8%–5.5%)) as well as with increased frequency of respiratory symptoms . In a further paper we have shown , that the association between air pollution levels and cardiopulmonary death rate was strong and statistically significant. This was also true for cardiovascular death, which we focused on in this paper (table 4). Table 4 shows the results of the Cox' regression analysis for the impact of air pollution exposure on cardiovascular mortality adjusted for confounders (model (a)) and additionally for respiratory disease or symptoms (model (b)). The risk ratios for the association between air pollution and cardiovascular mortality differed only marginally (<10%) between model (a) and model (b). We also tested all interactions between respiratory diagnosis and symptoms and air pollution on cardiovascular mortality. All p-values were above 0.3. Therefore no separate estimates in strata defined by respiratory health are given. The influence of respiratory health indicators (diagnoses and symptoms), assessed at baseline investigation, on the association between air pollution exposure (traffic, NO2, PM10) and cardiovascular mortality in a cohort of women aged 55 years at baseline investigation; results of a Cox' regression analysis. 1 Analyses on long term exposure to air pollution were made on subjects who were living longer than five years under their current address. For both lung function indicators the assumption of hazard proportionality over time was not valid. We therefore applied stratified Cox' regression analysis for model (b). The results are presented in table 5. In this sub-group of women with lung function measurements, the associations between traffic related pollution (NO2 and small distance to mayor road) and cardiovascular death were particularly strong. This again might be due to the study design which led to more pronounced contrasts in traffic related pollution. The associations between traffic related air pollution exposure (distance to major road and ambient NO2) and cardiovascular mortality were modified by impaired lung function. However, this modification was contrary to the meaningful expectation that impaired lung function would increase the risk ratio of air pollution exposure. The influence of lung function indicators, measured at baseline investigation, on the association between air pollution exposure (traffic, NO2, PM10) and cardiovascular mortality in a cohort of women aged 55 years at baseline investigation; results of a Cox' regression analysis. Our study demonstrates that impaired respiratory health at the age of 55 is a risk factor for cardiovascular mortality. Women with impaired lung function had a higher cardiovascular mortality risk especially in the first years after the investigation. The impact of air pollution however was even less strong in these women than in those with normal lung function. We could not find an indication that women with impaired respiratory health would have an increased risk of suffering cardiovascular death associated with increased long-term exposure to air pollution. Therefore, long-term air pollution exposure and impaired respiratory health are independently associated with cardiovascular mortality. Our findings in regards to the positive association between respiratory impairment and cardiovascular mortality are consistent with other published studies [23, 8–10]. The studies from Schunemann et al. and Sin et al. also showed that decreased pulmonary function is a risk factor for cardiovascular mortality [8, 10]. Yet, these studies did not investigate the relation between impaired respiratory health and air pollution-associated cardiovascular mortality. In contrast to these studies we found that the risk associated with impaired lung function declined over time. There are several hypotheses about the general pathways of cardiovascular effects due to increased levels of air pollution [24, 25]. One hypothesised that a biological pathway for cardiovascular mortality associated with long-term exposure to air pollution is pollution-induced lung damage. It suggests that in individuals who are susceptible, exposure to air pollution especially to ultrafine particles can induce alveolar inflammation, which subsequently result in respiratory illness and then in cardiovascular death [11, 12]. The second hypothesis indicates that lung inflammation induced by air pollution not only leads to lung diseases, but independently can also cause vascular and heart diseases [25, 26]. Alveolar macrophages and lung epithelial cells process inhaled particles or other air pollutants, this pro-inflammatory mediators not only promote a local inflammatory response in the lungs, but can also translocate into the circulation and induce a systemic inflammatory response . Consequently, the possible biological pathway for this association is systemic inflammation and the progression of atherosclerosis . Further, air pollution can lead to altered cardiac function due to a change in heart rate and blood pressure and finally lead to death [29–32]. The results of our study are more consistent with the second hypothesis. In fact, in our cohort study we could show that air pollution and impaired respiratory health are independently associated with cardiovascular death. Indeed women with already impaired lung function had a higher cardiovascular mortality risk especially in the first years after the investigation compared to those with normal lung function. But, increased levels of air pollution did not influence the mortality of these women. On the contrary, the relative risk of cardiovascular mortality associated with air pollution appeared to be higher in women without impaired lung function. In some women possibly, impaired lung function might be a sign for a still unknown but manifest cardiovascular disease which subsequently leads to early death not related to air pollution. However because of the relative small subgroups we chose a p-value of 0.3 to indicate an interaction. Therefore, the evidence for the variation in risk between the sub-groups is still not strong. This observed result is in accordance with findings from the re-analysis of the Harvard Six City Study [4, 5]. In their study, Krewski et al. reported about the risk of death associated with exposure to fine particles in different sub-groups among them those defined by lung function. In their study subjects with compromised lung function had a slightly greater risk of death. However, none of these interactions achieved statistical significance. The results of this re-analysis did not provide evidence of variation in risks among population sub-groups . In a previous time series study, DeLeon et al. observed that individuals with contributing respiratory conditions whose primary cause of death was circulatory were more affected by elevated levels of air pollution This role of respiratory disease in air pollution related cardiovascular mortality could not be confirmed in our study. There are two major differences to our study. First, the DeLeon-study focused primarily on daily mortality counts and the listing of the contributing respiratory causes on the death certificates. However, time-series studies can only investigate associations with the most recent exposure compared to cohort studies, which are able to show acute and chronic effects of air pollution on diseases and mortality. Second, DeLeon et al. demonstrated that the effect was only visible in older individuals (aged 75 and older) with underlying respiratory diseases. Older individuals were more susceptible to adverse effects of air pollution. The women followed up in our study were at most 73 years old. Therefore, the lack of effect in our study might be due to the younger age range. Our study has certain limitations. The respiratory symptoms and the chronic bronchitis were self-reported, which might lead to some reporting bias. Furthermore, the women received only one lung function measurement, and we relied on cause-of-death data from death certificates which has the potential of bias for specific cause of death. As in most studies dealing with influences of covariates on survival of population groups, we chose Cox' Regression for analysis. This is basically a multiplicative approach. Therefore, our result of an independent association of air pollution and respiratory health on cardio vascular mortality can only be interpreted in this multiplicative context. The number of women with reduced lung function, respiratory diseases and cardiovascular mortality was low with respect to the statistical power of the study and was further reduced by stratification. Another limitation is the incompleteness of air pollution measurements. Values for the reference areas Borken and Dülmen before 1990 were imputed assuming similar trends as in the high-polluted areas. The estimation of ambient air PM10 concentrations by using TSP measurements may add another limitation to the study and may result into a bias of our risk ratio estimates. Indeed, assuming a smaller conversion factor for the rural area, for instance 0.65, which means greater fraction of coarse particles in TSP compared to the urban areas, the inconsistency of the results between table 4 and table 5 diminished. In tables 4 and 5, the risk ratios for PM10 using model (a) increased and showed similar results to the risk ratio for the influence of traffic and NO2 (data not shown). However, this modification of the TSP/PM10 conversion factor did not influence our main results, namely, the association between lung function and respiratory health indicators and cardiovascular mortality. The strength of our analysis is the long follow-up of our cohort with multiple exposure assessments of air pollution levels and different respiratory health assessments (respiratory symptoms and lung function measurements). In conclusion, the results from our analysis show that impaired respiratory health as measured by diagnoses, symptoms and lung function is related to an increased subsequent cardiovascular mortality. Women with impaired lung function had a higher cardiovascular mortality risk, especially in the first years after the investigation. We observed some indications that the impact of air pollution however was weaker in these women than in those with normal lung function. We therefore concluded that long-term exposure to high levels of air pollution affects respiratory health and cardiovascular death independently in a group of middle aged women. However, due to the short follow-up period of these women, we might have underestimated the long-term air pollution effects on less pronounced respiratory damage. A further follow-up study of these women is needed to provide more information about cardiovascular mortality in this group when they become older. The authors would like to thank the North-Rhine Westphalia State Environment Agency (LUA-NRW), in particular Andreas Brandt, Martin Kraft, Knut Rauchfuss, Hans Georg Eberwein, and Thomas Schulz for the provision of the traffic count maps and fruitful discussions. We also would like to thank the local medical teams at the following health departments (Borken, Dortmund, Dülmen, Duisburg, Essen, Herne, Gelsenkirchen) for conducting the examination of the women. We, further, would like to acknowledge R Dolgner and M Islam for co-ordinating the study and the spirometry. The Ministry of the Environment of NRW financed the baseline study and the mortality follow-up. U. Gehring was supported by a research fellowship within the Postdoc-Program of the German Academic Exchange Service (DAAD). TS performed the statistical and epidemiological analysis, drafted and wrote the paper. DS was co-investigator of the repeated cross-sectional studies, performed the Geographical Information System analysis, performed the statistical analysis and was responsible for the data management. UK was main investigator of the repeated cross-sectional studies, commented and advised on the statistical analysis and commented on the manuscript. UR was co-investigator of the repeated cross-sectional studies, commented and advised on the statistical analysis and commented on the manuscript. HEW commented on the manuscript. UG was co-investigator of the mortality follow-up and commented on the manuscript. JH was main investigator of the mortality follow-up and commented on the manuscript. All authors read and approved the final manuscript.